Opening an online web shop needs to be planned and researched the same as any business venture would be. Part of that process is choosing the best domain name for your E Shop. In practice, setting up and maintaining an ecommerce venture has many similarities to a ‘bricks and mortar’ store but the differences become apparent in respect of the ‘location’ and marketing practices to gain visitors who in turn become your customers. To establish a High Street shop you need to find a good location and come up with a clever business name, if you pick out a prominent location that gets a decent amount of drive or walk by traffic and you put up a big sign in front of your store, you have a good chance of getting enough costumers and sales to pay the bills. 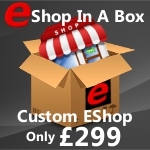 How will your customers find your online shop? With the advent of the Internet and with many businesses shifting to e-commerce, the whole concept of advertising an online business has turned into a complex affair that requires forethought and planning. Where the bricks and mortar business naming method was straight forward enough to launch a new enterprise, in today’s online marketplace, naming a business has to be done carefully and requires research and an element of luck. ‘Luck?’ …… Yes, in order to establish an online business web site you need to register a domain name for it. The domain name will be the name of your ecommerce web site and because all search engines such as Google or Yahoo, Bing etc in some way or another use the web site domain name to classify it and then list it within their Internet directories, choosing a (domain) name for your ecommerce business requires a great deal of thought and then finding a domain name that is still available requires luck. Whats so important about your ecommerce Domain Name? For example, suppose that you wanted to start an ecommerce web site selling phones. If you were starting a high street phone store in your local town, you could use your own name as a business name without any problem, say your name was Jim Bloggs, you coluld name your phone shop Jim Bloggs Ltd and then put up a sign with some phones painted on it, and below your name you could say something like “The Latest Phones Store”. So whenever people walk or drive by your business they will see your shop sign and immediately know that you are selling phones. However, that same approach with naming an ecommerce web site and the domain name ‘jimbloggsltd’ and you will find that it will be nearly impossible for you to market and sell your products because you will not be seen and indexed by the search engines so easily within your chosen ecommerce sector eg phones. The best approach in this instance is to select a domain name for your ecommerce site that contains one or more of the key words that people would type into a search engine when looking to buy a phone online. With this in mind, you might want to register a domain name such as LatestPhonesShop.com, PhoneDeals.com, OnlinePhoneStore.com, or any domain containing the word phone in it. Having a domain name for your ecommerce web shop containing relevant keywords will be advantageous to you as they contain the key word for your product. People looking to buy phones are much more likely to include the word ‘phone’ in their search query. Choosing a domain name that contains a keyword relevant to your ecommerce product or business will increase the chances of your eshop being included under the right search term in the search engines indexes increasing the likelihood of getting targeted cutomers to your online web shop. Looking for a Domain for your ecommerce store?